What Day Of The Week Was December 24, 2000? 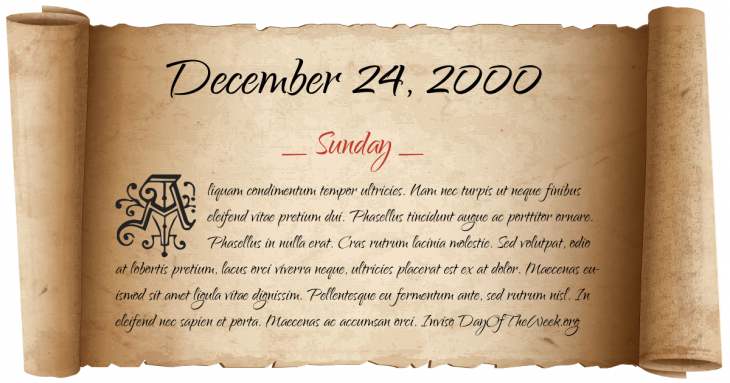 December 24, 2000 was the 359th day of the year 2000 in the Gregorian calendar. There were 7 days remaining until the end of the year. The day of the week was Sunday. A person born on this day will be 18 years old today. If that same person saved a Dime every day starting at age 5, then by now that person has accumulated $486.50 today. The Texas 7 hold up a sports store in Irving, Texas. Police officer Aubrey Hawkins is murdered during the robbery. Who was born on December 24, 2000?